NEW YORK, NY--(Marketwired - Oct 1, 2015) - CBX has created a new brand focused on the manufacture and sale of a wide variety of products primarily related to sleep and comfort. 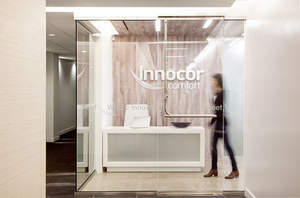 The new Innocor brand platform, which is based on the unifying theme of "Where Innovation and Comfort Meet," ties together three companies acquired by global private equity firm Sun Capital Partners, Inc. In the new identity system created by CBX, the overarching parent brand is Innocor, Inc.; the consumer-facing retail products business is called Innocor Comfort; and Innocor Foam Technologies refers to the B2B business. These brands encompass three companies acquired by Sun Capital: Flexible Foam Products, Inc., Sleep Innovations and Advanced Urethane Technologies. "The client hired CBX to bring to life a new brand that could conceptually and aesthetically unify all three of these well-regarded companies," explained Gregg Lipman, CEO and Managing Partner at CBX. "The project involved developing the new Innocor name, designing brand marks, as well as branding a showroom for Innocor products in the Flatiron district of Manhattan." CBX conducted an in-depth analysis of brands in the foam industry as part of the project. To unify the entities acquired by Sun Capital, the branding agency focused on four primary attributes shared by all three companies: comfort, innovation, trust and quality, Lipman explained. "These attributes are reflected in the new Innocor brand mark," he said. "The letterforms combine comforting, rounded shapes with sharper lines in a way that suggests a fine balance between innovation and comfort. Likewise, the sweeping graphic breaks softly and gently, but with a layered, forward momentum that, again, suggests this balance of comfort and innovation," noted Rick Barrack, Founding Partner and Chief Creative Partner. The CBX team used color to highlight different brand attributes for each of the Innocor companies. "For the parent entity, we used red to bring out the more confident aspect," Barrack said. "For the customer-facing retail brand, we highlighted the cool colors that are common to the category. On the OEM technology side, we used teal -- a nice balance of warm and cool -- to signal innovation." Memory foam pillows, mattresses, mattress toppers, residential and commercial floor mats, furniture and other products branded with the Innocor Comfort name are already appearing on shelves at many of the larger sleep products retailers, Lipman noted. Finally, CBX designed how the Innocor brand would come to life in the showroom in Manhattan's Flatiron district. The team created a three-dimensional version of the brand mark in chrome, brushed aluminum and translucent acrylic, as well as a prominent graphic mural across a 30-foot glass wall inside the showroom. "We changed what might otherwise have been a purely functional office into a gallery space that was inspiring and that could showcase Innocor's innovative product offerings," Barrack said. "It was exciting to bring this brand to life in 3D." Note to media: Digital files of Innocor's corporate, retail products and B-T-B business logos are available from Parness & Associates. CBX’s extensive work on the Innocor corporate identity project included designing how the new brand would come to life in the company’s Manhattan showroom, creating a three-dimensional version of the brand mark in chrome, brushed aluminum and translucent acrylic.